Dense breast tissue is detected on a mammogram. Additional imaging tests are sometimes recommended for women with dense breasts. If a recent mammogram showed you have dense breast tissue, you may wonder what this means for your breast cancer risk. Doctors know dense breast tissue makes breast cancer screening more difficult and it increases the risk of breast cancer. Review your breast cancer risk factors with your doctor and consider your options for additional breast cancer screening tests. Together you can decide whether additional screening tests are right for you. Dense breast tissue refers to the appearance of breast tissue on a mammogram. It's a normal and common finding. Breast tissue is composed of milk glands, milk ducts and supportive tissue (dense breast tissue), and fatty tissue (nondense breast tissue). When viewed on a mammogram, women with dense breasts have more dense tissue than fatty tissue. On a mammogram, nondense breast tissue appears dark and transparent. Dense breast tissue appears as a solid white area on a mammogram, which makes it difficult to see through. How do doctors determine if you have dense breast tissue? The radiologist who analyzes your mammogram determines the ratio of nondense tissue to dense tissue and assigns a level of breast density. A: Almost entirely fatty indicates that the breasts are almost entirely composed of fat. About 1 in 10 women has this result. 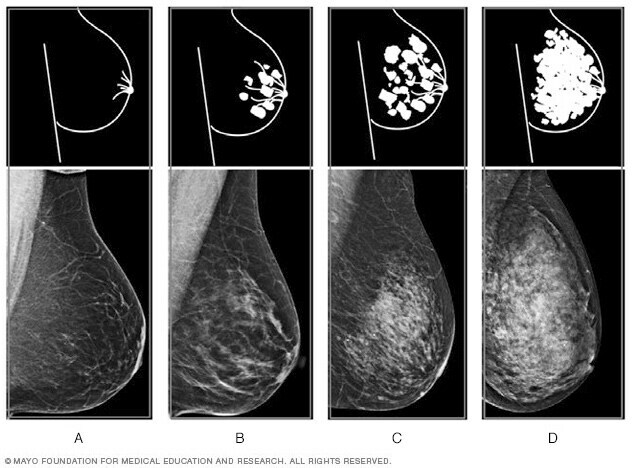 B: Scattered areas of fibroglandular density indicates there are some scattered areas of density, but the majority of the breast tissue is nondense. About 4 in 10 women have this result. C: Heterogeneously dense indicates that there are some areas of nondense tissue, but that the majority of the breast tissue is dense. About 4 in 10 women have this result. D: Extremely dense indicates that nearly all of the breast tissue is dense. About 1 in 10 women has this result. In general, women with breasts that are classified as heterogeneously dense or extremely dense are considered to have dense breasts. About half of women undergoing mammograms have dense breasts. It's not clear why some women have a lot of dense breast tissue and others do not. Have a lower body mass index. Women with less body fat are more likely to have more dense breast tissue compared with women who are obese. What tests are recommended for breast cancer screening? Most medical organizations recommend women with an average risk of breast cancer consider regular mammogram testing beginning at age 40 and consider repeating the screening annually. Women with dense breasts, but no other risk factors for breast cancer, are considered to have a higher risk of breast cancer than average. They may benefit from annual breast cancer screening. Dense breast tissue makes it more difficult to interpret a mammogram, since cancer and dense breast tissue both appear white on a mammogram. Very dense breasts may increase the risk that cancer won't be detected on a mammogram. Despite concerns about detecting cancer in dense breasts, mammograms are still effective screening tools. The most common type of mammogram — digital mammogram — saves images of your breasts as digital files instead of film and allows for more detailed analysis. This is more effective at finding cancer in dense breast tissue than older film mammogram technology. Are other tests more effective? There's some evidence that additional tests may make it more likely that breast cancer is detected in dense breast tissue. But additional tests carry additional risks, and no additional testing method is proved to reduce the risk of dying of breast cancer. You and your doctor may consider additional or supplemental testing based on your other risk factors and your personal preferences. 3-D mammogram (breast tomosynthesis). Tomosynthesis uses X-rays to collect multiple images of the breast from several angles. The images are synthesized by a computer to form a 3-D image of the breast. Many mammogram centers are transitioning to incorporate 3-D mammograms as part of the standard mammogram technology. Breast MRI. MRI uses magnets to create images of the breast. MRI doesn't use radiation. Breast MRI is recommended for women with a very high risk of breast cancer, such as those with genetic mutations that increase the risk of cancer. Breast ultrasound. Ultrasound uses sound waves to analyze tissue. A diagnostic ultrasound is commonly used to investigate areas of concern discovered on a mammogram. Molecular breast imaging (MBI). MBI, also known as breast-specific gamma imaging, uses a special camera (gamma camera) that records the activity of a radioactive tracer. The tracer is injected into a vein in your arm. Normal tissue and cancerous tissue react differently to the tracer, which can be seen in the images produced by the gamma camera. MBI is performed every other year in addition to an annual mammogram. Every test has pros and cons. While each test is proved to find more breast cancers than a mammogram, none of these newer imaging tests is proved to reduce the risk of dying of breast cancer, as has been done with the standard film mammogram.